Over 700 community leaders, researchers, policy makers, practitioners, professionals, advocates, and students will join forces in November in their commitment to change the world for people with disabilities and their families. 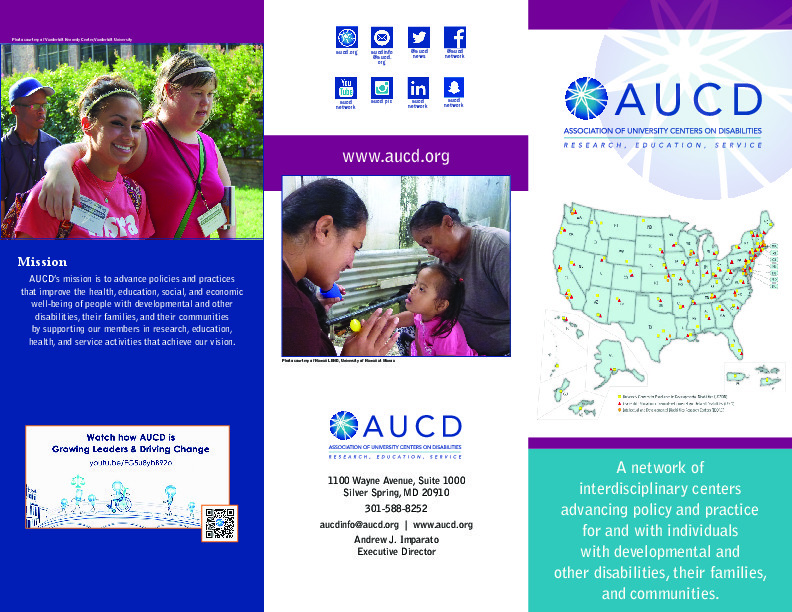 Packed with workshops, meetings, receptions, and plenaries, the AUCD conference is designed to promote innovative thinking that will catapult disability policy, research, and advocacy initiatives to the next level. Prominently display your materials and products and enjoy valuable one-on-one time with conference attendees. Located in the Grand Ballroom Foyer occupied by attendees throughout the conference, the exhibitor space allows for maximum exposure and return on your investment. Come share your innovation and promising practices with over 700 disability leaders, practitioners and self-advocates. Spaces are limited so submit your exhibitor application today! These programs serve and are located in every U.S. state and territory and are all part of universities or medical centers. They serve as a bridge between the university and the community, bringing together the resources of both to achieve meaningful change.